Macaroni and cheese is everyone's favorite comfort food. Besides being a tasty dish, mac and cheese is extremely versatile; you can make it a main entrée or simple side dish. For a heartier dish with extra protein, add bacon, chicken, or ham, or spice your mac and cheese up with jalapeño peppers or Tex-Mex seasonings. Or add some steamed vegetables and use a variety of cheeses. The possibilities are endless! Get yourself started with these cheesy and delicious recipes and ideas. 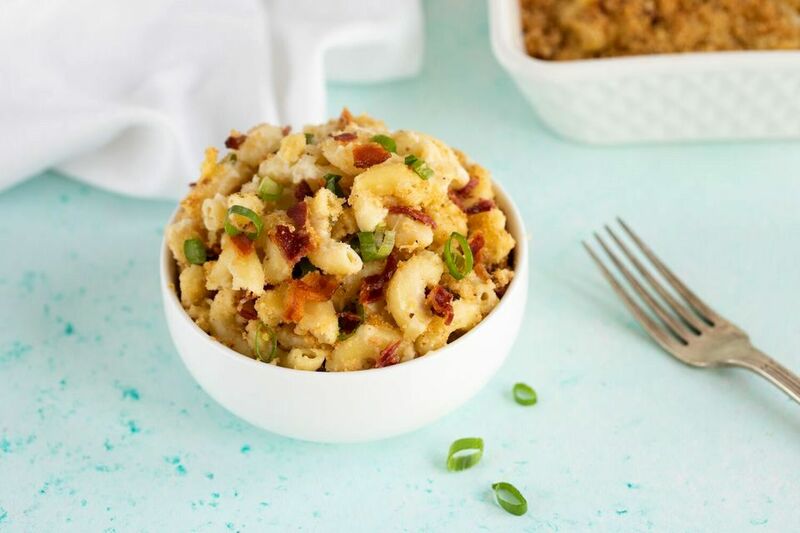 Green onions and a dash of garlic powder flavor this macaroni and cheese with bacon. The dish is baked to perfection with a buttered bread crumb topping. If you have a cheesy craving and want it fast, this Instant Pot mac and cheese is the way to go. Just cook the macaroni in the pot (3 to 4 minutes!) and then add the milk and cheese. That's all there is to it! This classic baked macaroni and cheese is a fabulous dish to serve as a side dish or main dish. This mac and cheese is topped with buttery bread crumbs and is an excellent choice for any meal or occasion. This macaroni and cheese casserole is a simple, homey recipe that lends itself to many possible variations. Ingredients include cheddar cheese, butter, eggs, and milk, and there's no sauce to make. Looking to take your mac and cheese to the next level? Try this delicious truffled mac and cheese. It can take a mundane dish and make it elegant and rich. Have some extra macaroni and cheese leftover? Usually, no, but these macaroni and cheese croquettes will inspire you to make an extra batch just so you can enjoy these the day after. Don't just take our word for it! Give it a shot! If you're looking to spice things up, try this jalapeño macaroni and cheese, try adding jalapeño peppers. They provide a little bite and will transform your baked macaroni and cheese. We are sure it will quickly become a family favorite. This genius combination of grilled macaroni and cheese sandwich will be an instant hit. Add some sliced bacon, tomatoes or peppers to make this dish a heartier meal. This easy one-pan broccoli macaroni and cheese is quick and easy, and the kids just might eat their broccoli! This is a gluten-free vegan macaroni and cheese. No longer do you have to avoid this delicious dish! This is another great kid-friendly combination. This basic sloppy Joe macaroni and cheese recipe is topped with buttered bread crumbs. Looking for a slight variation on the traditional mac and cheese recipe? This baked macaroni and smoked cheddar cheese is definitely something special. This French macaroni and cheese is made with French cheeses. Crème fraîche, Gruyere cheese, and Cantal cheese are among the ingredients. If you can't find Cantal cheese, use a good quality white cheddar cheese or a farmhouse cheddar. There's no need for a sauce in Sandy's 3-cheese macaroni and cheese. Eggs, evaporated milk, butter and three kinds of cheese are among the ingredients that make this rich mixture a stunner. 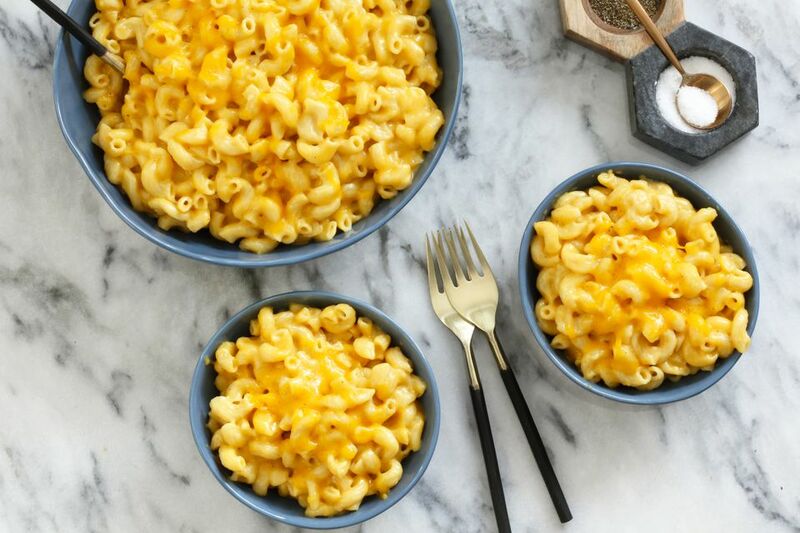 This mac and cheese recipe makes about 8 servings of kid-pleasing macaroni and cheese with Monterey Jack and cheddar cheese. The sauce for this creamy family-favorite macaroni and cheese is made with cheddar and American cheese. Feel free to use all cheddar or add some Gruyere to the sauce. The baked macaroni and cheese with gruyere cheese and panko crumb topping is a rich and satisfying main dish. This slow cooker macaroni and cheese with variations is a snap to fix and cook in the slow cooker. Add ham or bacon if you'd like. It can be finished in the oven with a bread crumb topping. Ground beef and tomatoes make this casserole a cross between macaroni and cheese and chili mac. Corn and bell pepper add color and flavor to this delicious Tex-Mex macaroni and cheese. Fresh herbs, goat cheese, sharp cheddar, and Parmesan cheese make this extra special three-cheese macaroni and cheese extraordinary. This crowd-pleasing bacon and jalapeño macaroni and cheese has it all! It's made with plenty of shredded cheese, bacon, and jalapeño pepper rings. The casserole is topped with bread crumbs and baked to perfection. This flavorful, gluten-free macaroni and cheese is made with gluten-free macaroni, Cheddar, Parmesan, fontina and Gruyere cheeses. You won't miss the wheat pasta! This big, hearty one-skillet cheesy beef and macaroni dish makes enough for 8 to 12 people. It's a breeze to fix and cook in a big skillet. A small amount of Dijon mustard is added to the cheese sauce for this delicious creamy macaroni and cheese. Use light cream or half-and-half for a richer sauce. The casserole is topped with buttery croissant crumbs. No time to make a sauce? No worries! This fuss-free simple macaroni and cheese, made with layers of cooked macaroni, shredded cheese, butter, and cream, is a great last-minute dish when you're in a rush. Cottage cheese and sour cream turn this otherwise ordinary macaroni and cottage cheese casserole into a spectacular, creamy casserole. Use pasta shells, mini penne or elbow macaroni in this delicious chicken pasta casserole with cheddar cheese and bacon. Tomatoes, browned Italian sausage, and bell pepper make this a hearty one-pot meal. The macaroni and cheese casserole with sausage is baked with a bread crumb topping. A jar of Alfredo sauce is combined with three kinds of cheese and seasonings to make this easy 3-cheese crockpot mac and cheese. The finished dish is topped with toasted bread crumbs. This is another excellent kid-friendly and family-friendly recipe. These four-cheese mac and cheese muffins are made with Cheddar, Monterey Jack, mozzarella and provolone cheeses.